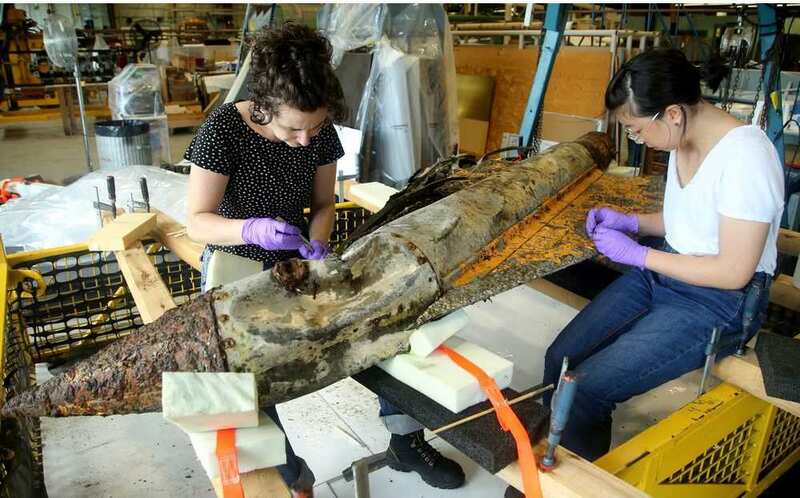 A bent and corroded hunk of what looks like scrap metal is getting the undivided attention of a team of restoration experts at the Canada Air and Space Museum as a link to one of the country’s most important aviation stories. The rocket-powered model of the Avro Arrow was recovered in August from the bottom of Lake Ontario by the Raise the Arrow group. Although it’s basically intact, it was covered in zebra mussels, and cleaning the surface is a big job using tweezers and dental tools. Once it’s cleaned up it will go on display with the last remaining intact pieces from the Arrow program, which was famously cancelled in 1958 by Prime Minister John Diefenbaker. After ending the huge effort, which involved 14,000 workers in Toronto and elsewhere, Diefenbaker ordered the five prototypes and all the drawings and tooling destroyed. The cockpit and nose of one of the aircraft survived and is at the museum.